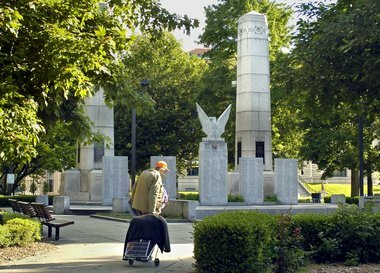 GRAND RAPIDS, MI â A team of architects and landscape designers will soon start the process of working with a citizens group to update and restore two aging downtown parks that commemorate local war heroes. The Downtown Development Authority (DDA) approved a $139,000 contract Wednesday with a design team led by OâBoyle, Cowell, Blalock & Associates of Ann Arbor. The team also includes Quinn Evans Architects and Fishbeck, Thompson, Carr and Huber (FTC&H) and is supported by Bazen Electric and LandArc Studio. Working with a 23-person citizens committee, the team will develop a plan to restore Veterans Memorial Park, which includes several memorials to local soldiers killed and wounded in battle and Monument Park, which includes the Kent County Civil War Monument. “We look forward to engaging the community in this planning process,” said Christopher Reader, chairman of the steering committee in a DDA news release. Veterans Memorial Park, which occupies the block north of Fulton Street east of Sheldon Avenue, is in line to get more than $877,000 from tax dollars generated by improvements made to the former downtown YMCA building, now known as Fitzgerald Condominiums. Originally home to the Kent County Courthouse, Veteran Memorial Park features two granite obelisks listing the names of casualties of World War I. The obelisks and a reflecting pool were placed in the park in 1918. Several additional monuments have been added since. In Monument Park, the 127-year-old Civil War Monument was restored in 2004. The DDA has set aside $350,000 to update the triangle-shaped park surrounding the statue. Both parks are locally Designated Historic Landmarks and Monument Park is designated a Federal Historic Space.